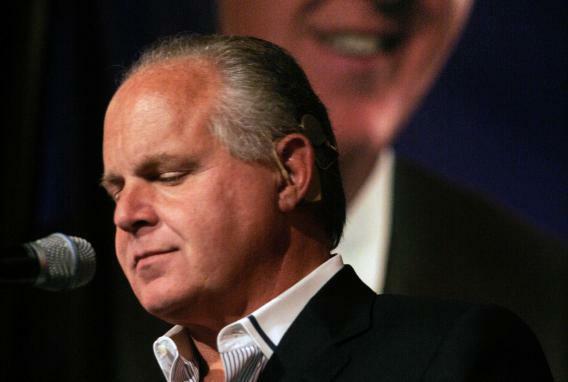 Rush Limbaugh to Marco Rubio on Immigration Reform: "What You Are Doing is Admirable and Noteworthy." Radio talk show host and conservative commentator Rush Limbaugh speaks at ‘An Evenining With Rush Limbaugh’ event May 3, 2007 in Novi, Michigan. Sen. Marco Rubio has an advantage that few Republicans can claim: They want to win the presidency, and they think he’s got what it takes to do it. So he’s uniquely able to go onto conservative media and calm down the table-bangers. They don’t want to make him look bad! Exhibit A was Mark Levin, for whom every liberal action is a move toward Stalinism. After Rubio went on the show, Levin started talking calmer about reform. Exhibit B — more important — came at 1:07 p.m., when Rubio talked to Rush Limbaugh one day after Limbaugh promised to lead the opposition to the bill. Rubio started by saying he remembered Limbaugh’s TV show; the host, duly flattered, cut to the questions. “The same language is being used today as was used in 1986,” Limbaugh said. Rubio found his out. “Unless these mechanisms for enforcement are in place, I won’t support it.” He was hinting that he could turn on the bill if it was weakened in negotiations. Given that any bill would need to be strengthened to pass a Republican House, this was a strawman argument, but it worked, and Limbaugh moved on. Easy. “I am confident — I really am — that given a fair chance I can convince most Americans, including Hispanic Americans, that limited government is better for them than big government,” Rubio said. After only a few minutes, Limbaugh was letting Rubio off the hook and suggesting that he stood in the way of a lawless president. “He’s promised he’s not going to do border security first,” said Limbaugh. Sort of hard to square with the administration’s deportation record, but run with it. Limbaugh was basically sold. He wondered if Obama wanted to “fulfill his dream of eliminating any viable political opposition in the media” by killing Rubio’s bill, a totally contradictory theory to the “he wants more Hispanic voters” theory, and easy for Rubio to dismiss by promising to stay tough.